Three petrels leaving the mouth of the Mersey at 6:45am, seen from Perch Rock, then at least another three from the lifeguard station a little further west along the promenade at about 7:45am. It was an exhilarating experience this morning, I arrived at New Brighton at 6:30am and made my way to the bus shelter at Perch Rock in the half light, with the wind battering me with a cocktail of sand and heavy rain. 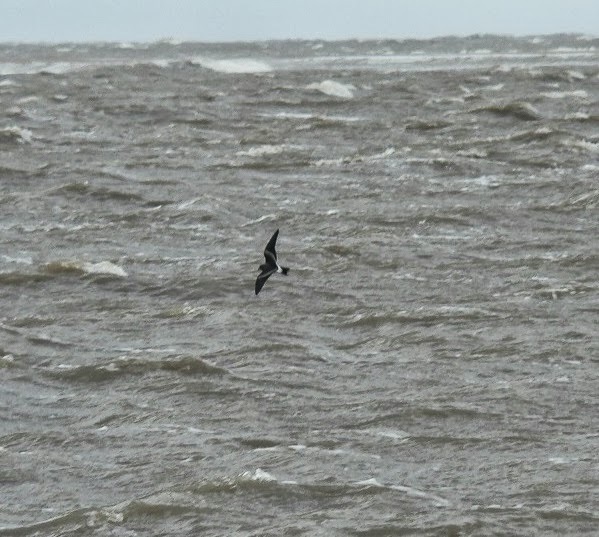 Almost immediately I saw one, a Leach's storm-petrel battling against the wind as it attempted to leave the mouth of the Mersey. About the same size as a Starling, it's hard not to be impressed by these enigmatic little guys as they are lost to sight in the swell, pattering across the water looking for food when it would seem that survival against the elements would be more appropriate. They breed in burrows on the remotest oceanic Scottish islands, only returning to their nests under cover of the darkest nights to avoid predators, they spend all winter out at sea, way beyond sight of land and they are only seen offshore during the severest storms. Birders travel from all over the UK to see these birds here in the North West. Of my three companions this morning, one had travelled from Halifax, another from Bolton and the third had travelled over night from Norfolk, all to be here for dawn. With Liverpool docks as a backdrop, and large ships leaving the river, Leach's storm-petrel is the bird of Merseyside and North Wirral, it should be our emblem. They'll be offshore from now until the end of October, but only when the wind blows from the north west. Don't miss them while they are here. If you want to see Leach's storm-petrel, you could do a lot worse than follow this thread on Bird Forums.